Pet Memorial Stone With Urn - Gone Yet Not Forgotten..
> Pet Memorial Stone With Urn - Gone Yet Not Forgotten.. 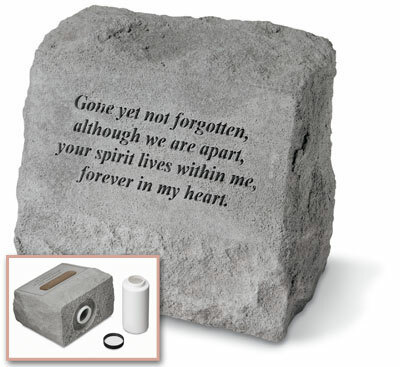 This beautiful memorial headstone has a rich texture with the look, feel and weight of true stone. Made of cast stone, it is weatherproof and has year-round durability. A container in the bottom can hold a memento of a loved one or a beloved pet. Note the headstone size that allows for discrete placement in front of a tree or in a garden. Product details: Made of cast stone in the USA. Weatherproof and guaranteed to last a lifetime.